Seven entertaining, retold folktales involving Princesses, Princes, Magical Creatures, and Extraordinary Happenings. This wonderfully entertaining collection of re-adapted folktales, which has pen and ink illustrations at the beginning of each story, includes characters like the Princess, who pretended she was a Prince in order to save her father's kingdom, a greedy King who wanted to safeguard his wealth by hiding his daughter underground, a Prince who gambled to save his mother, a Prince who went to great lengths to save his sister and mother, seven Princesses who underwent quite a few trials, a Princess who was abandoned for speaking the truth, and a Prince who sets off on a magical adventure. Many years ago, in a land very far away from here, there lived a good and wise King, and he had three very lovely daughters. Now it came to pass that the Kingdom, peaceful thus far, was threatened by the approaching armies of an Emperor who desired to conquer the entire world and become its Overlord. In this quest, the Emperor had crushed many Kings and had allowed them to escape with their lives only under two conditions. First, they had to pay him an yearly tribute, and, second, they had to send one of their sons to his court as a hostage to serve him for ten years. This was a practical way of curtailing any future attempts at revolt. If the defeated Kings were foolish enough to rise against him, he would punish them by having their sons executed. For a long time, the King resisted the aggressive onslaught of the Emperor’s forces, but, as years passed and he grew old and his people wearied of the continuous warfare, he decided that the time had come to sue for peace. If the yearly tribute had to be paid, well, so be it, that monetary sacrifice could be shouldered, but what was he to do about sending a son to the Emperor when he didn’t have a son? The Emperor was quite adamant on this point. A son had to be sent. Or else, warfare would be resumed. The three Princesses did not like to see their Father so weighed down with worry, and they wanted very much to help him save their Kingdom. So they conferred amongst themselves and then approached him with a plan. The eldest said that she would dress up as a boy and go to the Emperor’s court and remain there for ten years as was required. And so the eldest Princess set about preparing for her departure. She ordered a new set of fashionable clothes. She bought the richest provisions available for her journey. She picked the most spirited horse in the royal stables. She ordered a shining suit of armor and a shining sword with a bejeweled handle. She made a very fine figure when she was finally ready to leave. Her father embraced her and gave her some last minute advice on the proper courtly behavior for a young Prince. 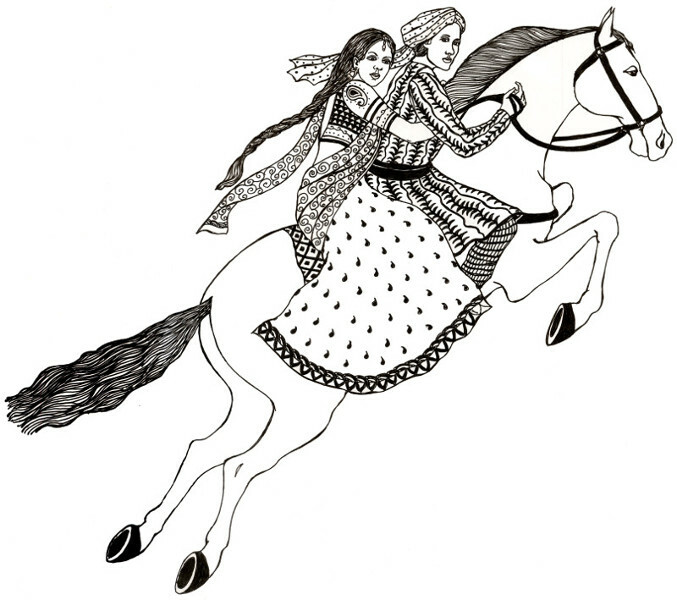 Then, saluting her father and sisters and the citizens, she spurred her horse and rode off, followed by her escorts. The party remained in fine fettle until they reached the first bridge that led out of the city. Here, quite unexpectedly, a ferocious tiger sprang out of the bushes, roaring mightily and shaking them out of their complacency. Everyone scattered in terror, and the frightened Princess turned her horse and raced right back to the palace.